After working as a manager & training director for a large pest control firm, Chuck saw the need for a true customer service company. Not only solving current pest problems, but letting customers know how to prevent future problems. 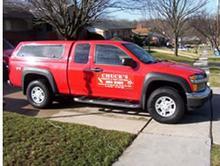 CHUCKS TERMITE & PEST CONTROL is family-owned and operated right here in Cincinnati, OH. Since our company opened in 1993, we’ve treated every customer like they were a part of our family. Other companies may offer similar services, but our services are the best, and come with a personal touch.